In search of ever more Diaspora stories, our tireless travellers found time for a boat ride up the Ottawa River under the Alexandra Bridge and past the Rideau Falls, Earnscliffe House, and McKay’s New Edinburgh, before clambering aboard another greyhound bus headed towards Quebec. They made their way to the Lachine National Historic Park: although Lachine is a borough of Montreal today, it was a separate settlement in the days of the fur trade. Alongside the canal, the team visited a stone storage shed, built in 1803 by Scotsman Alexander Gordon. Here trade goods and furs were stored for the North West Company, which was established by Scottish fur merchants in 1779 with its headquarters in Montreal. After 1804 the company amalgamated with its main rival, the Hudson Bay Company. The Golden Square Mile or “Square Mile” developed at the foot of Mount Royal in Montreal and was home to the industrialists and financiers of the second half of the 19th century - shipping, timber, mining, rail, fur and banking. 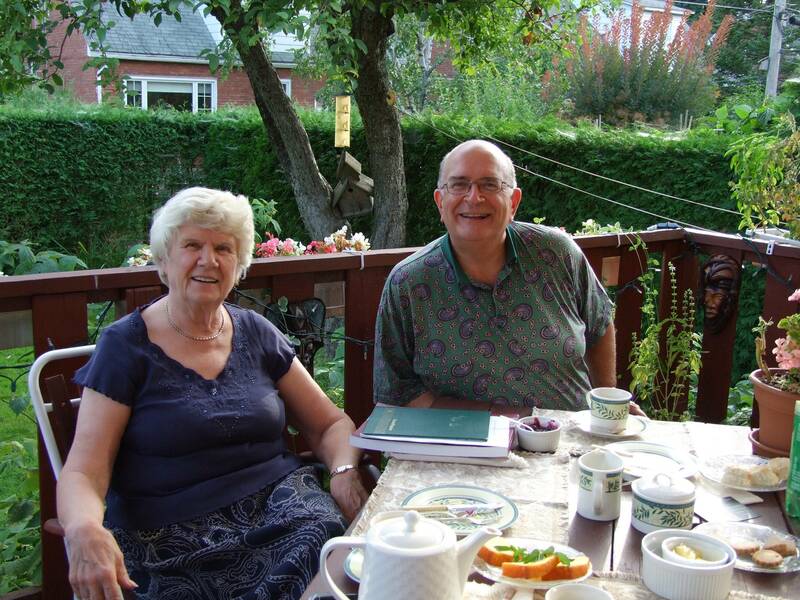 The current President of the St. Andrew’s Society of Montreal kindly collected Gillian and Yvonne from Lachine, who were then treated to tea and an array of home-baking at the Montreal home of Moira Barclay-Fernie. Bruce Bolton and Moira are pictured on the left. Moira was keen to emphasise the sense of welfare and the importance of education which the Scots and the St Andrew’s Society brought to Montreal, a legacy which continues today. Moira is an elder commissioner from the Presbytery of Montreal and she pointed out that the Presbyterian Church has always played an important role in Diaspora communities since the days of the first settlers: the church introduced pastoral care for the settlers, with ministers travelling on horseback to the six or seven parishes in their care. We left Moira’s house confident that there would be a group of keen stitchers and storytellers in this community. It was soon time to head to Nova Scotia, beginning with a stop in Halifax. From 1869-1871, Citadel Hill or Fort George was home to the 78th (Highlanders) Regiment of Foot and the 78th Highlanders (Halifax Citadel) Pipe Band. Halifax’s annual Royal Nova Scotia International Tattoo was established by Colonel Ian S Fraser in 1979 and marked the first International Gathering of the Clans outside Scotland. Meeting our team at the Canadian Museum of Immigration at Pier 21 was chief curator Tanya Bouchard and Carrie-Ann Smith, Chief of Audience Engagement. We were guided through the museum’s site, where from 1928 to 1971 immigration facilities catered for immigrants, refugees and Canadian soldiers leaving for WWII. Of particular interest - but requiring further research - will be the stories relating to Scottish war brides and child evacuees. Eager to cover yet more miles, Gillian and Yvonne hired a car and set off across Nova Scotia to Pictou, where in 1773 the Hector disembarked the first Scottish settlers at Brown’s Point, Pictou Harbour. A replica of the vessel is moored alongside the Hector Quay where Troy MacCulloch, 2nd Vice President of the Federation for Scottish Culture in Nova Scotia and Deputy Mayor of New Glasgow, as well as Karla MacFarlane from the Hector Heritage Quay Society, met them to discuss the Tapestry project. Members of the Prince Edward Island Scottish Settlers Historical Society, Mary Gallant and Aggi-Rose Reddin also joined them and there was soon a clear sense of the passion Maritime Scots have for their Scots heritage. Mary’s story of the Maple Hill MacDonalds can be read on the diaspora website here. Captain John MacDonald of Glenaladale transported Scottish immigrants in the brig Alexander in the early 1770s and they settled in the Tracadie Bay area. Protestant lowlanders settled in the Malpeque Bay area in the 1770s and the Earl of Selkirk brought 800 Highland Scots to settle in the Belfast area in 1804. Charlottetown is considered the birthplace of the Confederation after initial discussions were held here in 1864. On Troy MacCulloch’s recommendation our team left the Hector Quay to visit the Dr Thomas McCulloch House Museum. According to the guide there, the house was built for the Presbyterian minister from stone used as ballast in the ships sailing from Scotland. Dr McCulloch founded Pictou Academy in 1816 a non-sectarian college based on the University of Glasgow, as well as being an avid collector of birds! A display of mounted birds remains in the house but the majority of the collection are kept at Dalhousie Museum in Halifax. Back on the road, the journey to Cape Breton Island saw our researches passing along huge stretches of tree-lined roads. At intervals side-roads disappear into the forest many of them beginning with Mac/Mc. We stayed the night in Baddeck at The Telegraph House, once the home of David A Dunlop and still owned by the family. Dunlop was responsible for laying the first Atlantic telegraph cable from Newfoundland to Cape North. The Telegraph Hotel opened its doors in 1861 to travellers and also served as the first telegraph office, hence the name. Dr Alexander Graham Bell retired to Baddeck in a house overlooking Baddeck Bay just a short walk away from the hotel. The house is now a Parks Canada Historic Site. The following day, in dreich weather similar to that back in Scotland, Gillian and Yvonne visited Rodney Chaisson, Director of the Highland Village Museum, and Rodney MacDonald, Chief Executive Officer of the Gaelic College. The college was founded in 1938 by Rev A W R MacKenzie as a school devoted to the study and preservation of the Gaelic language and Celtic arts and culture. The Cabot Trail abounds with crafters, and with kilt-makers and weavers amongst the staff at the college there should be no shortage of stitchers and interesting stories from Scottish descendants.